For Ruth Hillebrand, compassionate health care was both a professional and personal mission. A clinical psychologist in Manhattan, she specialized in treating patients with eating disorders. She also had an intimate knowledge of how compassion on the part of a physician could impact a patient’s treatment and recovery. A physician whom she met once delivered her own terminal diagnosis in a brief, perfunctory, late-night phone call and then hung up. After her experience, Ruth became determined to help other patients avoid devastating experiences like hers. She passed away in 1994 from mesothelioma, a rare form of cancer linked to asbestos exposure. Following her death, her brother, Joseph Hillebrand, a 1943 Notre Dame graduate, established the University’s Ruth M. Hillebrand Center for Compassionate Care in Medicine in 2004. The center’s mission is to advance the scientific theory and practice of compassionate care in medicine and to promote effective communication skills in physicians, nurses, health care executives and managers, and allied health professionals. The Hillebrand Center fulfills its mission in three ways: undergraduate professional training, research on compassionate care in medicine, and providing training and consultation to health care organizations and individual clinicians. 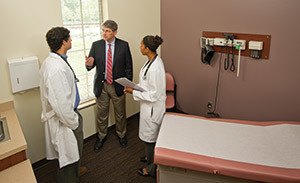 The center also has a research team focusing on the science of compassionate care and communication skills. “We have found that we not only can contribute to the field with our research, but also that the undergraduate students who help do this research are transformed by the research that we do,” Vachon says. “We have just completed the ‘Good Doc–Bad News’ research study in which we did a qualitative study interviewing patients and their loved ones who thought their doctor delivered bad medical news in the best possible manner. There are so many stories of how bad medical news is told to patients poorly. The center has also provided training, consultation and collaborative support to many health care organizations. Vachon notes that undergraduates as well as health professionals have been very receptive to the idea of compassionate care being fully integrated in all aspects of medical care. Undergraduate preprofessional students learn the practical skills of working with patients through innovative programs. The center is part of the Department of Preprofessional Studies and the Center for Health Sciences Advising chaired by Rev. 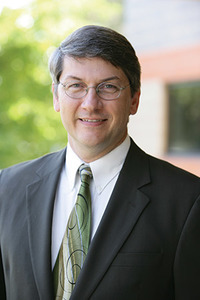 James Foster, C.S.C., M.D., in the College of Science. Vachon is a medical psychologist who has spent much of his career training physician residents prior to coming to Notre Dame. The logo for the Hillebrand Center for Compassionate Care in Medicine is a heart of gold surrounded by the DNA double-helix, representing the increased scientific understanding that compassion is a foundational part of our genetic makeup and integral to being human. It also represents the hope that the source of whatever we do comes from a heart rooted in compassionate caring. It’s an apt symbol of Ruth Hillebrand’s vision of compassionate care in medicine. Originally published by William G. Gilroy at news.nd.edu on May 19, 2016.